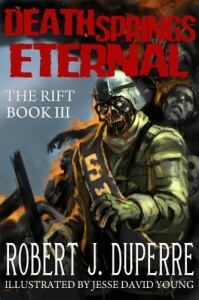 Author and New England Horror Writer member Robert J. Duperre’s book, Death Springs Eternal: The Rift Book III is available as an e-book and the fourth book in the series comes out in June. All the books in the series are illustrated by fellow NEHW member, Jesse David Young. For more information about the series, check out The Rift Online website. Along with writing novels, Duperre writes a blog, Journal of Always, which is “first and foremost a review blog,” where the reviews written by himself (and occasionally others). “It is also an attempt to highlight inexpensive Kindle books in the genres I enjoy reading, such as Fantasy, Science Fiction, Horror, and Thrillers,” Duperre said on his blog. To purchase Death Springs Eternal, click here. To purchase other paperback or e-book versions of his books, click here.